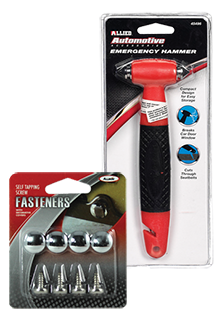 The Emergency Hammer is great if you are ever in a situation where you need out of your seat belt or car and for some reason the seat belt is jammed and the doors will not open this is the tool for you. The Emergency Hammer is multi-use tool. It is sure to save you when you are in a bind. The Prevent A Dent is the best protection for car doors. Included with the bumper guard is screws and wall anchors. We have the lowest prices in the nation~GUARANTEED!